CIAA’s Virginia State and Bowie State are also rising in the rankings. What do you do after you lose the best offensive player in your football program’s history? If you are North Carolina A&T, you just keep winning. 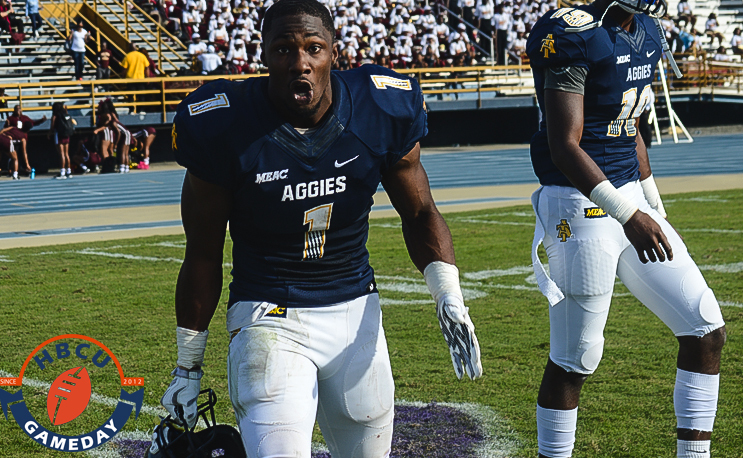 The Aggies are unbeaten (8-0) and now they have reached Top Ten status in the FCS Coaches Poll, released on Monday. A&T moved up to sixth in the poll on Monday, jumping five spots from no. 11 after beating Bethune-Cookman 24-20 at home on Saturday. The win gave A&T a perfect 5-0 record in MEAC play, joining Hampton (5-2, 4-0) as the only perfect team in conference play after its 34-31 win over FAMU on Saturday. Grambling also moved up four spots on the list, going from no. 17 to no. 13 after a convincing 41-14 win over SWAC East front-runner Alcorn State. GSU is now 5-1 and 16-2 in its last 18 games. In Division II football, Virginia State climbed four spots as well, moving up to 17th overall after a 73-21 win over Lincoln. VSU is now 7-0 and in the lead spot for the CIAA North Division championship. Just behind VSU is Bowie State, who rose from no. 23 to no. 20 with a 44-20 win over Virginia Union on Saturday. BSU is now 7-1, with its lone loss coming to VSU in Week Seven. North Carolina A&T is 5-0 in MEAC conference tied with no one. Please make the correction. Aggie Pride! The Division 2 Regional rankings will be interesting with a couple of the higher ranking teams losing this weekend. Can Coach Hendrick shape the Tigers into a SWAC contender?